European travelers who are users of the City Night Line trains are exposed to a great shock this year. There are in fact travelers who prefer the European night trains – also to avoid the environmentally disastrous “cheap” airlines. But with the encouragement of many politicians and bureaucrats, the “cheap” airlines undermined the economy of the night trains. Because the environmental costs of air travel is not taken into account. Yet a little of 2016 offers night trains still a pleasant way to travel at night with sleeping cars, couchettes and coaches with reclining seats. And with room for bikes, wheel chairs and large luggage. And without frequent changes of train. DB wants to give up all these “real” night trains because they consider them unprofitable and will replace some of them with normal ICE- and IC-trains with only normal seats, lighting- and public address announcements all night. Forget trying to get a night’s sleep. DB will even let buses replace some night trains. The European network Back on Track think that the night trains are tailored to the 21st century, because they make it possible to travel 24/7. Night trains have previously linked cities across Europe together. Stockholm, Oslo, Copenhagen, Brussels, Ostend, Paris, Naples, Athens and many ski resort towns in the Alps has been on the list of destinations for years. 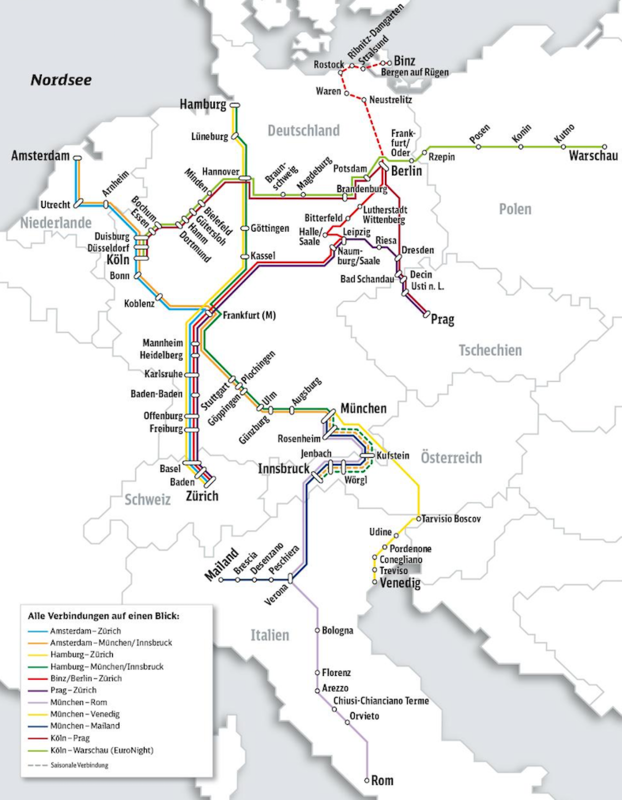 The cuts in the German network started at November 2014, when the night train to Copenhagen as the first was closed, later on followed by cancelled trains to Berlin, Paris, Prague and Amsterdam, but even in early 2016, the network of night trains is fairly intact and passengers can spend their days sightseeing and attending meetings, while traveling by night on a variety of routes connecting Austria, Holland, Italy, Switzerland, Poland and the Czech Republic. A great advantage of traveling by night train is the convenience to board the train in the middle of a city and arrive the next morning in the heart of another. The rhetoric that politicians at COP21 in Paris used to combat climate changes looks very empty now, when a large state railway company in this manner readily can throw 100,000’s of travelers from green transport to climate damaging air transport. The Back on Track network invites all climate-conscious Europeans to protest by sending e-mails to the German Transport Minister Alexander Dobrindt on alexander.dobrindt@bundestag.de and Martin Burkert, President of the German Parliament’s Transport Committee on martin.burkert@bundestag.de . Send also a copy of the letter for your own MEP. I am sincerely surprised to know, that DB is about to cancel all night train services during 2016. 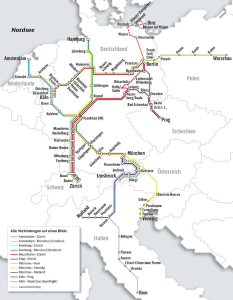 Maybe travelers outside Germany are not in your focus, but I can tell you, that this reduction of the international railway network is a serious attack of remaining possibilities to travel by rail to and from other European countries. We are soon entirely left with climate hostile airlines, making goals from COP21 even further away. Instead of short sighted solutions I urge you to find ways, where climate solutions go hand in hand with sustainable railway solutions. Take this window of opportunity: To travel by night in a bed is not old fashion, but in line with modern 24/7 thinking.